Since our last post we finish 6 projects! Many of them from last week's huge chair haul. We have upholstered many different chairs in Pendleton wool but never a Carter Bros. scoop chair. I have be wanting to upholster one for quite some time. I like how the neutral wood frame gives the cushion a visual floating effect. The fabric that we used is a limited print that is only available in Portland. 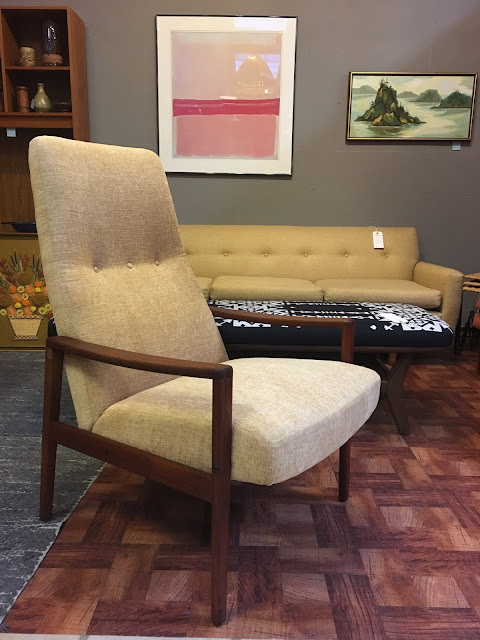 Highback Danish lounge chair newly upholstered in a light yellow fabric that contrasts nicely with the teak wood frame. Danish Oak rocking chair by Illum Wikkelso with a fresh coat of paint.